Valongo Wharf Archaeological Site comprises the globally most significant remains of an arrival point of enslaved African persons in the Americas. The wharf located at Rio de Janeiro’s Jornal do Comércio Square was built from 1811 onwards, and used until the construction of the Empress’ Wharf in 1843. About a quarter of all African American enslaved people to the Americas have arrived here. While its physical remains are modest (fragments of a pavement, a former road), its spiritual associations as a site of conscience for African Americans are strong. I visited this site on my first day in Brazil, as it is easy to reach, being in central Rio de Janeiro. I was not expecting much of it, and to be fair, it was a little underwhelming. As land has been reclaimed in the harbor, the Valongo wharf lies about 350 meters inland, and it is very difficult to imagine how it used to be. I usually don’t read too much about sites I plan to visit, trying to keep the excitement of the discovery intact. But for this site, it would have been better to research beforhand to better understand and enjoy the visit. It consists of part of the old stone wharf in the former harbour area of Rio de Janeiro, built for the landing of enslaved Africans reaching the South American continent from 1811 onwards. An estimated 900,000 Africans arrived in South America via Valongo. In fact, they were first landed in central Rio de Janeiro for Customs, and the moved on Bom Jesus Island for quarantaine. Only after quarantaine were they taken to Valongo to be sold in slaves markets. The site is composed of an archeological window, through which two main archaeological layers can be seem. The lowest level consists of floor pavings in pé de moleque style (irregular cut stone set directly on the sand), attributed to the original Valongo Wharf. Built in 1811, it was more a paved beach and remained in use until 1831. In 1843, the original wharf was earthed over to build a new wharf in honor of the arrival of Princess Tereza de Bourbon, wife of the Emperor Dom Pedro II. Nowadays, the Empress Wharf makes the upper layer of the site with a little jetty, made of regular cobblestones pavement. An obelisk was also built for the Empress arrival, still standing (even though not in its original position). In the early 20th century, the area was covered over to reclaim some 350 meter of sea. It was not until 2011 that archeological excavation was carried out to rediscover Valongo and Empress Wharfs. Although underwhleming at first, Valongo Wharf is an important physical trace of the arrival of African slaves on the American continent, and is an emotional tribute to thier suffering. 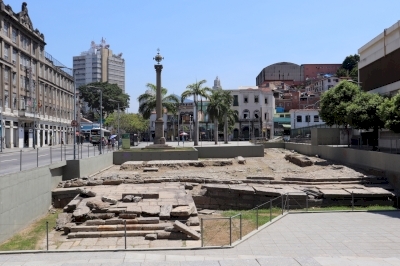 In brief, Valongo wharf (location) is the archaeological remains of the slave trading port in Rio which was one of the major points of entry of African slaves into the Americas. The wharf used to jut out into the harbour, but it is now quite a way from the water and there isn't a whole lot to see. 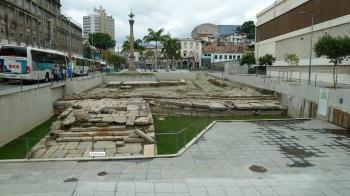 The small area of archaeological ruins lies on a newly constructed square in an otherwise unassuming part of central Rio next to a Hostpital. You can sort of make out a layout. Traces of walls give some perspective but you will need some extra input to make sense of what is a really interesting site, fortunately there are some multi lingual boards around the area to help. This interpretation shows the utterly devastating history of the wharf which really hit home when you see the numbers of people involved. The information boards gave an estimate of 500,000 people that were sold/processed on this site, which was the final grand construction in a city where it is estimated that a fifth of all African slaves in the Americas docked. It was utterly staggering for us that this specific construction was initiated in 1811, four years after this barbarous act was outlawed internationally in the British Empire. What struck us as extra strange was that this massive level of slavery took place in a city which presented the most multicultural face of any we had ever visited. Whilst we appreciate we didn't have a full grasp of Brazilian ethnic relationships, the utterly multiracial face Rio presented to us was something of a revelation. I live in one of the world’s more diverse cities (London) but it was still really impressive how integrated the population of Rio (and Brazil in general) felt to us as casual observers. It was therefore extra surprising that this site stood as a testament to such a heinous practice carrying on until so recently, illustrating that Brazil was the last country in the Western Hemisphere to ban slavery. There is a lot of regeneration work going on in relation to the World Cup and the Olympics. Part of this project has been to discover the historic importance of the area, and the world heritage site proposal seems to come out of that. There is a trail that includes the Cemetery of the New Blacks, the “Fattening Houses” and the Pedra do Sol where slaves unloaded goods at the base of one of Rio's many hills. There is also the hanging gardens of Valongo which were quirky and pleasant. This whole area is closely associated with the foundation of Samba, and other cultural traditions that aim to make sense of this countries complex ethnic history. I'm not really sure if there is enough left to qualify as Outstanding Universal Value. The site is already part of the UNESCO international slave route, and perhaps that is the appropriate level of recognition. 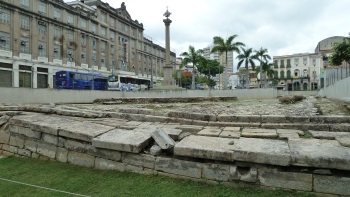 However Rio has such a huge role in the slave trade perhaps these meagre remains are enough to illustrate the massive human cost of the trade, and a lot of money is being spent in attempting to regenerate this section of the city and tell its full story. So I wouldn’t grumble too much if they were included. 2.0: Tevity Vicente B. Avanzado Jr.